TV Guide Close-Up for NET Journal – Copyright 1970 Triangle Publications, Inc. Although the Close-Up doesn’t mention it, this was a repeat of an NET Journal episode that originally aired in November 1969. The repeat aired on Monday, September 14th, 1970 from 9-10PM ET–or at least it did on the stations listed in the ad. NET Journal likely aired on many different days and at many different times on various NET affiliates. Less than a month after this repeat was broadcast, NET ceased operating as a network, making way for PBS. This particular Close-Up is from the Eastern New England Edition of TV Guide. 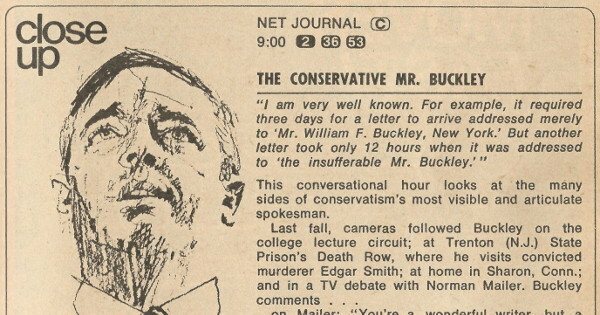 Channel 2 was WGBH-TV in Boston, MA; Channel 36 was WSBE-TV in Providence, RI; Channel 53 was WEDN in Norwich, CT.
William F. Buckley was the primary spokesperson for conservatism when the movement was still in its infancy, years before Rush Limbaugh and others brought it to the forefront of media coverage. He was graceful, educated and, even if you disagreed with him, you had to respect him.